Tim Iau, dan 7, Clwb Peldroed Segontium Rovers yn derbyn Cotia Glaw newydd wedi eu noddi gan Redline. ONE of Britain's greatest rally drivers has set a time for all go-kart enthusiasts to try and beat. 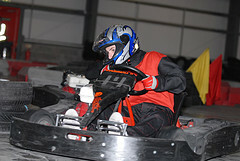 David Higgins, four times British Rally Champion, got a lap of 16.90 seconds at the Redline Karting track in Caernarfon. He was there competing against members of the public as part of a promotional event for the centre. The showpiece was a 10 lap race against one of North Wales’ most promising sporting talents, 12-year-old Luke Hughes from Llysfaen. David, of Trefeglwys, Mid Wales, just about managed to win and afterward said: "I thought he'd wipe the floor with me – it was a good race! 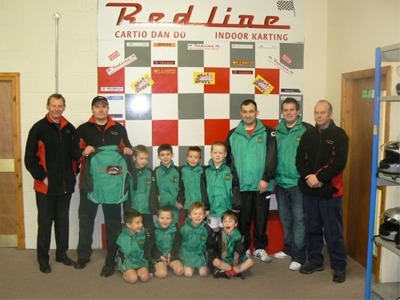 He added: "As well as promoting what goes on at Redline we’re looking for sponsors for the British Rally Championship." Despite his tender age Luke has won a shelf full of trophies: he was 6th in the British Championship in 2007 and last year he moved up to the Minimax class. He said: "It was great to race against someone like David. My aim this year is to get a top 10 position in the British Championships." I weld y fideo sydd yn cyd-fynd â'r stori, cliciwch yma.